OUT OF AFRICA: Achebe, 1930-2013, played a key role in developing African lit. 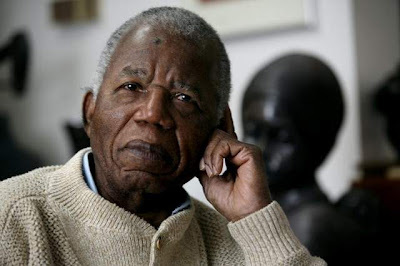 The literary world lost a cherished friend with the recent passing of Chinua Achebe, the internationally celebrated Nigerian author, perhaps best known for the groundbreaking 1958 novel Things Fall Apart. The Booker Prize winner, poet, professor, social commentator and essayist, died in Boston on Friday at age 82, according to his longtime publishers, Penguin Books. In 2007, at age 21, I had the once-in-a-lifetime opportunity to sit down with the great scribe for a one-hour interview, and the experience changed my whole outlook as an emerging writer. As it happened, Mr. Achebe was in the island to headline a cultural event slated for January 2 inside the Emancipation Park, as part of planned activities to mark the Bicentenary Anniversary of the Abolition of the Transatlantic Trade of enslaved Africans to Jamaica. After learning that he and his team were staying at the Jamaica Pegasus, I immediately telephoned the hotel and asked to be transferred to his room. Shortly afterwards, his son/manager came on the line. I introduced myself as a lifestyle reporter at the Observer, and after a few minutes of persuasion, I was invited to come up and have a talk with the great man. With my editor's approval and a photographer in tow, I headed out and arrived in world-record time, riding the elevator up to the suite. First impressions, they say, are everything. In the case of Achebe, a humbler man never drew breath. Calm and generous of spirit, he was a gracious host, while sporting the guise of a sage behind his trusty pair of spectacles. We sat at a table occupied by a laptop and a stash of books waiting to be autographed, as well as a few from which he would read at the event later that evening. The nearly hour-long interview progressed nicely and delivered ample proof of Achebe's genius and abiding love of his afflicted homeland. We spoke at length about his Nigerian roots, his thoughts on modern-day Africa, the controversial Joseph Conrad and, of course, the book that made Achebe world-famous, the seminal Things Fall Apart. But it was simply impossible for me to end the interview without getting him to comment on the startling fact that, even to this very day, he is yet to be bestowed with the elusive and much-deserved accolade: the Nobel Prize for Literature. I don't recall his exact words, but Mr. Achebe made it quite clear that the snub (there's no other way to describe it) wasn't an issue that bothered him in the least, let alone keep him up at night. I absolutely admired and respected his candour and conviction. Then it was time to go. The literary lion needed his rest. After all, he had a big evening ahead. Looking back, if I had to sum up the experience in three words, I'd opt for "a master class." His wisdom and his compassionate view of the world (and where we all belong in it as people of African ancestry) still resonate with me. I'll cherish the memory always. And I still believe he deserves the Nobel Prize.